The Park and Facilities Catalog is a leading manufacturer and supplier of commercial site furnishings to parks, schools, shopping centers, multi-family communities, HOAs and office buildings since 2001. 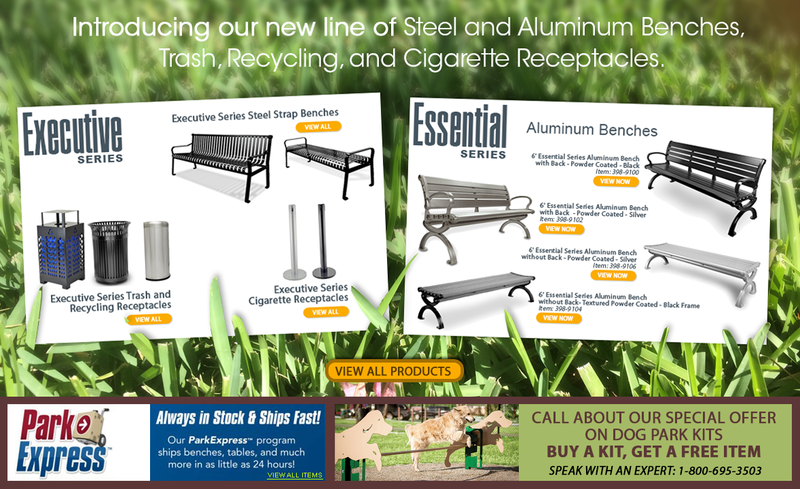 We offer thousands of diverse, commercial-grade products including park benches, bicycle racks, bleachers, picnic tables, trash receptacles, commercial planters, dog park equipment, park grills and so much more. The Park Catalog and Highland Products Group have been outstanding to work with. I've been using them for my various needs here at my camp for a number of years and they have never failed to deliver. My representative, Carrie has gone above and beyond to accommodate any request I have made and service has always been prompt and courteous. Thank you for following up in regards to the purchasing of several pieces of equipment from the Park and Facilities Catalog. I have been dealing with Michael and he has been fantastic. I just wanted to thank you and your company for all your help on the tables and chairs we purchased! They are very durable and really brighten up our outside covered area! We have received a lot of compliments on how nice they are and we will definitely keep you guys in mind in the future. I ordered 10 picnic tables in the spring and we love them. Kudos to your company! Your customer service is second to none and quite refreshing in this day and age of self-service shopping! The park benches arrived. We are very pleased with the look and quality. You were most helpful with advice. I appreciate you working with me on this project. I am very fortunate to do business with a reputable company. We had ordered Bike Racks for our project from The Park Catalog and they are currently on-site and installed. So far, no issues and our customer seems to be happy with them. Thanks for the follow-up, that quote should now be a completed order. Thanks! I really appreciate how you and The Park Facilities Catalog have handled the issues during my picnic table order. It shows how professional your company is and frankly how lucky they are to have you working with them for the overall satisfaction of the customer. Thank you for your prompt and caring service, and for getting the dance floor to us so quickly. You are a real professional, and I appreciate your customer service skills! Thank you for outstanding assistance in purchasing these lockers. A very happy customer. Thanks Rosealee. You have been wonderful. Our Club members have actually commented on how nice our new umbrellas are.